March 26, 2018, 12:15 p.m.
By Christine Schmidt @newsbyschmidt March 26, 2018, 12:15 p.m. These pubs…bring people’s bare digital necks bared to vampires ravenous for the blood of personal data, all for the purpose of “interest-based” advertising. What will happen when the Times, the New Yorker and other pubs own up to the simple fact that they are just as guilty as Facebook of leaking its readers’ data to other parties, for — in many if not most cases — God knows what purposes besides “interest-based” advertising? And what happens when the EU comes down on them too? It’s game-on after 25 May, when the EU can start fining violators of the General Data Protection Regulation (GDPR). Key fact: the GDPR protects the data blood of EU citizens wherever they risk having it sucked in the digital world. The sins are different; but they are still sins, just as apples and oranges are still both fruit. Exposing readers to data vampires is simply wrong on its face, and we need to fix it. That it’s normative in the extreme is no excuse. Nor is the fact that it makes money. There are morally uncompromised ways to make money with advertising, and those are still available. But just as Facebook was warned about the potential for actors like Cambridge Analytica for years, third-party tracking on news organizations’ sites has been discussed before too. As publishers try to strengthen trust with the public, will it stick this time? Melody Kramer did a Q&A with the Electronic Frontier Foundation’s Jacob Hoffman-Andrews about this topic last year for Poynter. She pointed to a few studies that had already evaluated third-party tracking on news sites, concluding that those external parties could continue to build detailed profiles on site visitors. “The [web]sites of the world can agree to our terms, rather than the other way around.” https://t.co/IPT7YTmuKi Wouldn’t that be amazing? Here’s the new principle for marketing on the internet. 1. Instead of guessing, let me tell you what I want. 2. In return you don’t spy on me. Zillow works this way. So could everything. The net result would be more dollars spent. I’m absolutely sure of it. POSTED March 26, 2018, 12:15 p.m.
Schmidt, Christine. "Will news organizations face Facebook-fueled blowback for using third-party tracking on their own sites?." Nieman Journalism Lab. Nieman Foundation for Journalism at Harvard, 26 Mar. 2018. Web. 19 Apr. 2019. Schmidt, Christine. "Will news organizations face Facebook-fueled blowback for using third-party tracking on their own sites?." Nieman Journalism Lab. Last modified March 26, 2018. 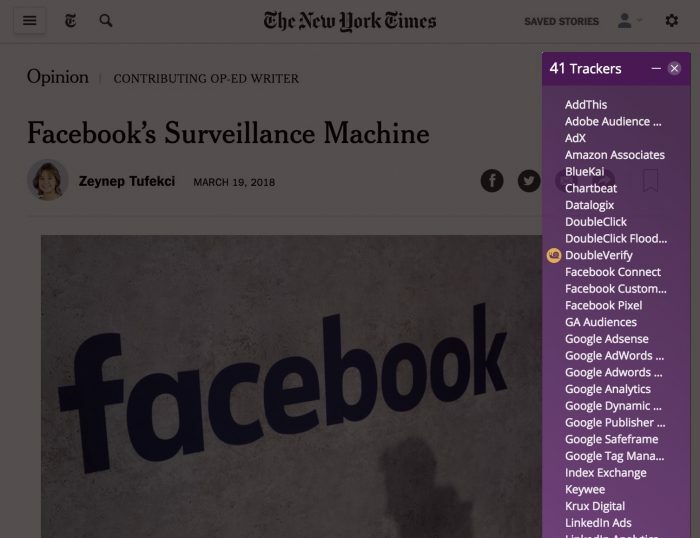 Accessed April 19, 2019. https://www.niemanlab.org/2018/03/will-news-organizations-face-facebook-fueled-blowback-for-using-third-party-tracking-on-their-own-sites/. | title = Will news organizations face Facebook-fueled blowback for using third-party tracking on their own sites?